Science, University of Virginia’s College at Wise, Virginia, USA. 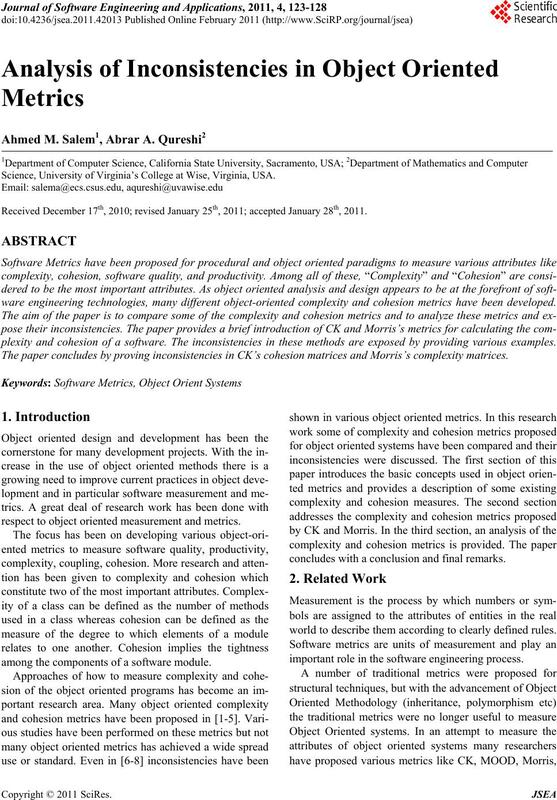 Received December 17th, 2010; revised January 25th, 2011; accepted January 28th, 2011.
ware engineering technologies, many different object-oriented complexity and cohesion metrics have been developed. plexity and cohesion of a software. The inconsistencies in these methods are exposed by providing various examples. 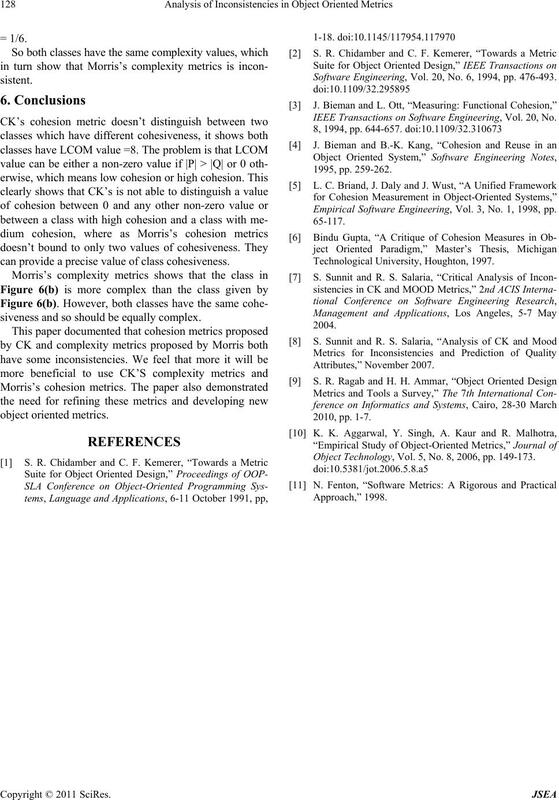 The paper concludes by proving inconsistencies in CK’s cohesion matrices and Morris’s complexity matrices. respect to object oriented measurement and metrics. among the components of a software module. concludes with a conclusion and final remarks. world to describe them according to clearly defined rules. important r ol e in the so ftware enginee ri n g pr ocess. mains to be a challenge in software engineering. proposed by CK and Morris, are discussed and compared. measures and H. Morris’s Degree of cohesion of objects. complexity & cohesion metrics are discussed. ing is a brief discussion on CK’s metrics. Figure 1. Inheritance tree of objects with complexity 1/8. M2, M3 and I1, I2, I3 are instance variables respectively. of tree or total number of sub nodes . objects of the tree is equal to 3. Figure 2. 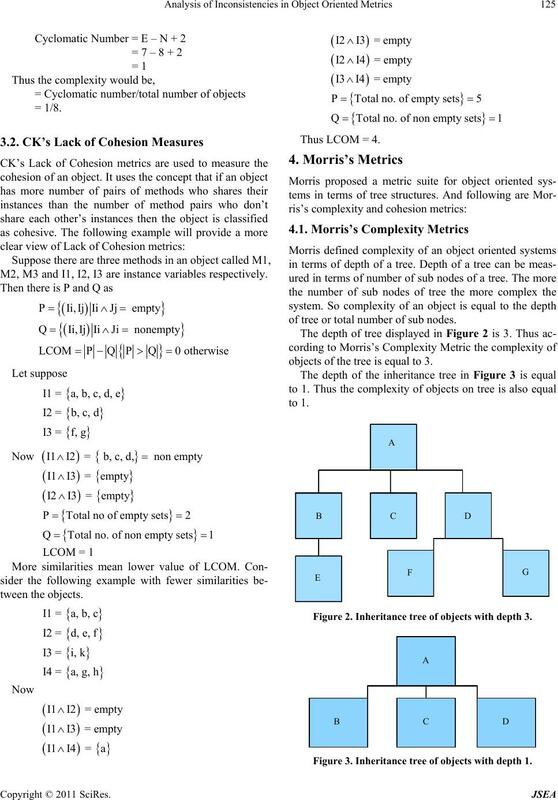 Inheritance tree of objects with depth 3. Figure 3. Inheritance tree of objects with depth 1.
the fan-ins to the object. Degree of cohesion = 11/7. some objects have medium cohesiveness. jects with Degree of Cohesion = 11/7. thods (Ii) and Instance variables (Ji) with LCOM = 8. 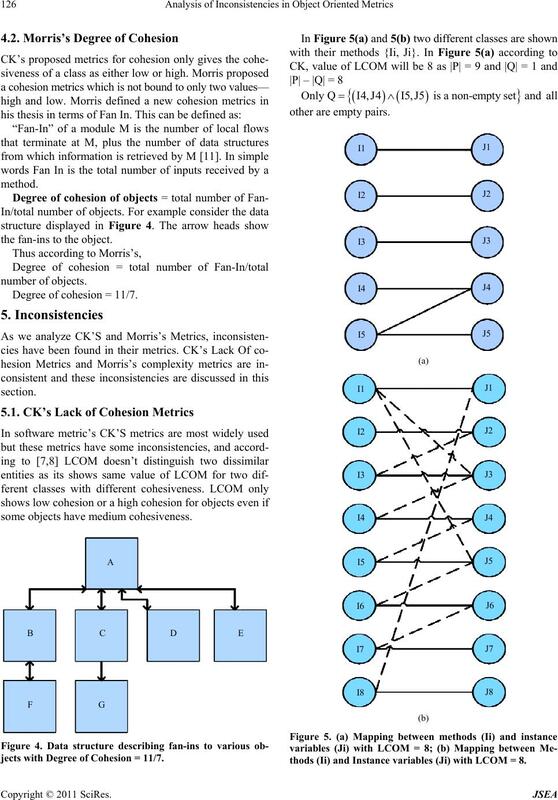 10 non empty pairs (|Q| = 10) of (Ii, Ji) so |P| – |Q| = 8.
represent a precise value of cohesiveness of a class. zero but maximum value is not defined. ure 6(a) and Figure 6(b). 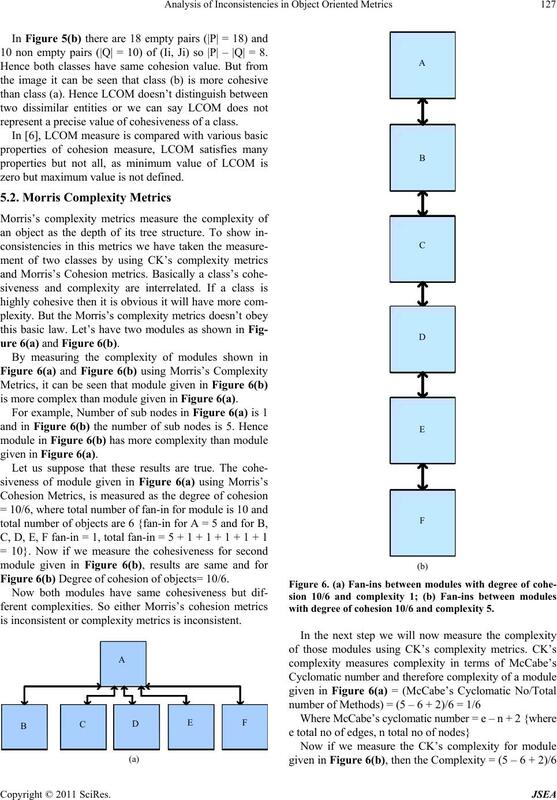 is more complex than module given in Figure 6(a). Figure 6(b) Degree of cohesion of objects= 10/6. 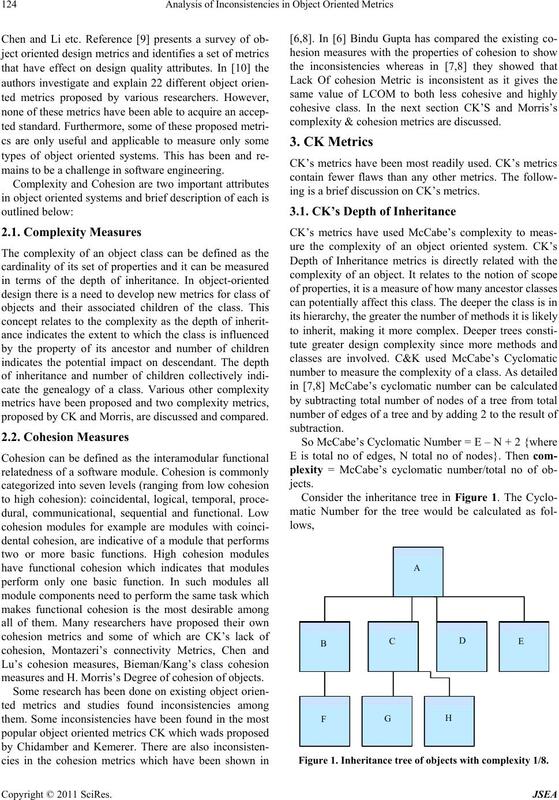 is inconsistent or complexity metrics is inconsistent. with degree of cohesion 10/6 and complexity 5.
can provide a precise value of class cohesiveness. siveness and so should be equally complex. Software Engineering, Vol. 20, No. 6, 1994, pp. 476-493. IEEE Transactions on Software Engineering, Vol. 20, No. Empirical Software Engineering, Vol. 3, No. 1, 1998, pp. Object Technology, Vol. 5, No. 8, 2006, pp. 149-173.